Just finished building and testing my first HeaterMeter 4.3. In testing the blower in voltage mode it comes on briefly and then dies no matter what setting. If I increase the fan it spins for a second and dies again. In pulse mode it is working perfectly. Can it be run in this way? What can be wrong? I checked all my connections. Could it be a bad component? Sounds like you've got something bridging the feedback circuit so it thinks the voltage is too high. When voltage mode first turns the fan on, it sets it to 100% for a short time then starts trying to achieve the target voltage. If it already thinks the voltage is too high, it will lower the output, which it probably keeps doing until the fan turns off. Check the capacitor adjacent to the pin on the microcontroller labeled BFB (blower feedback) to make sure it isn't bridged to the FO3 capacitor. If you have a multimeter, check that BFB and FO3 pins are not connected to each other. If that checks out, then check your connections from BFB back along the red line here checking everything is connected as it should be. Note that the voltages in this diagram are for when the blower is off so that does not apply to your situation. You just want to follow that red line back from BFB and make sure all the connections are sound up until it becomes the first blue line. I just had a chance to check all the connections and everything check outs. There is no bridging on the BFB and F03 and all the connection with the red line are sound. Any Idea on what to try next? Below is a snippet of the HM schematic showing the blower driver circuit, everything to the right of D2 is in the blower feedback circuit. 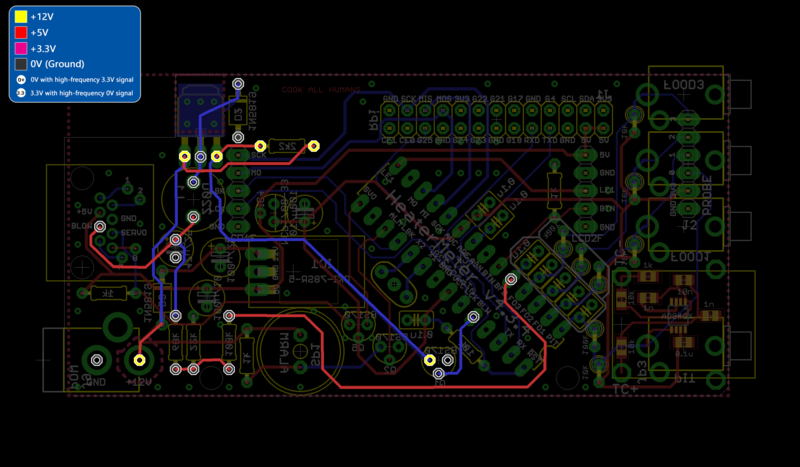 Check those components for proper value, proper polarity on the diode and cap, good solder, no shorts etc. Also check solder on Pin 24 of the ATMega. Checked everything and found a bad solder on the 22k. Working great now. Thanks. Nice, glad you got it worked out!